Ah, inns/bars/taverns/alehouses... what good adventure can't be started in one of those? They're a rather iconic part of gaming. A group of individuals finds themselves in some bar in some small town when Adventure comes calling. Or maybe Adventure was had and now it's time to spend some of that loot you found in the depths of some dungeon. What better place to do so than a bar? Well, Wizkids and Paizo have released their new Pathfinder Battles Rusty Dragon Inn Figure Sets to help add some liveliness to your tables for those bar scenes. You know, there's a ton of monster minis out there, but sometimes it's hard to find townsfolk. Well, that is no longer a problem. 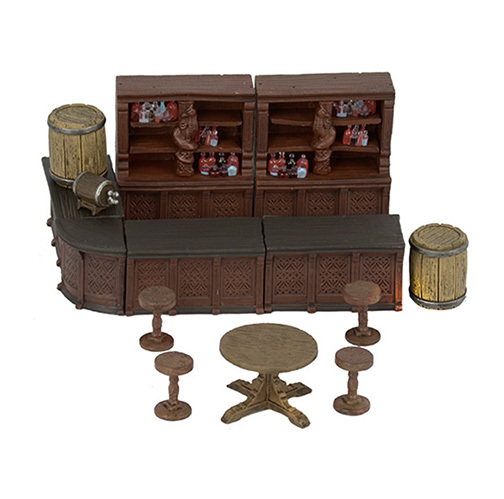 And more than just figures for various PCs and NPCs, there's actual furniture for your tavern as well. So if someone picks up and throws a table, you can actually move the table (or pick it up and actually throw it, depending on how animated your group is).